The industry's original Deluxe 6 oz kettle popcorn popper. 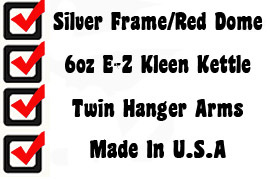 Welded top and bottom frame, bright aluminum finish, tempered glass, with EZ Kleen kettle. Heavy-duty reinforced top dome and side vents allow for displays on top. Ship bests by truck. May be able to ship UPS. Please call for best pricing. Twin hanger arms are slanted for more kettle room. Heavy duty kettle drive motor.